Southern Gospel Observations From the Mind of Brian Fuson…..
My first Album Review of 2019 features one of my favorite quartets on the road today. 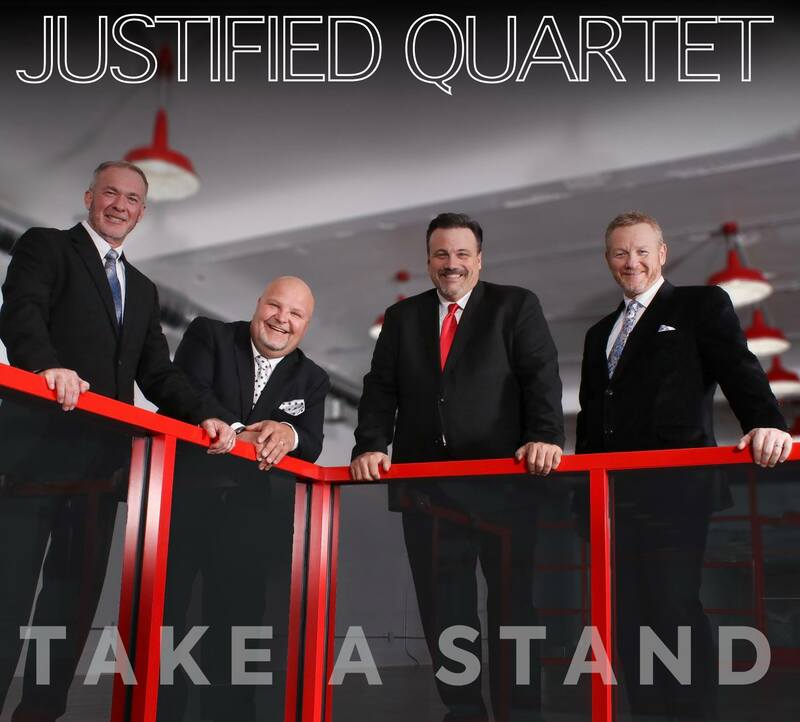 Take A Stand is the brand new recording from Michigan’s Justified Quartet. The groups lineup, comprised of Dave Potts on tenor, lead singer Carl Ledford, Mark Jacoby on baritone, and bass vocalist Tim Caldwell have been putting out some of the best recordings in Southern Gospel in the last 6 years, while building a fan base across the Wolverine State and other states in the Midwest. Produced by respected Southern Gospel veteran Bob Caldwell (Kingdom Heirs, Brian Free & Assurance, Statesmen & Won By One), Take A Stand features a mix of great new songs and some familiar tunes that SG fans will recognize. The project kicks off with the title cut, “Take A Stand”, written by Daryl Williams and Scotty Inman. It took me a while to listen past this song. I love this song, and it definitely will be a tune Gospel Music radio will love. “ Next up is a new Dianne WIlkinson song, “Even So Come Lord Jesus“, which features Ledford on the verses. This is a great song, with a funky, groovy, soulful vibe and Carl sings it. Things slow down a bit for “Don’t Be Caught Dead Without Jesus“, which features Caldwell. Next up is another song that will be familiar to many fans, “We’ve Got Our Ways”. Originally recorded by Won By One, I always loved this song and am so glad Justified has brought it back. Things slow down a bit for the ballad, “It Should Have Rained“. The Kingsmen recorded this song a couple years ago on their acclaimed Battle Cry project, but Justified’s arrangement is markedly different, featuring the tenor rather than lead. Potts does a great job on this song. The second half of the project starts with a great song, “We’re In The Same Boat“, which features Jacoby on the verses. Written by Rebecca Peck, this is a really good song with a great lyric, that tells the listener they have nothing to fear when the Lord is in your boat. Next up is “Heaven Is The Place Where Dreams Come True“, which features some good four part harmony. “Can’t Wait To Hear The Sound“, is a great song about the rapture that features Ledford. The guys tackle another great song Won By One fans will remember, “It Took A Lamb”, which features Jacoby. An excellent song that paints The project comes to a close with a great ballad “I Still Cling To The Old Rugged Cross” which features Potts. When we talk about the top quartets in Southern Gospel, we mention Triumphant, The Kingdom Heirs, Tribute and others. In this writers opinion, another name should be added to the list, Justified Quartet and you’ll hear the proof for yourself on Take A Stand. In an industry where multiple groups are produced by the same producers and everyone sounds alike, Justified stands out. Not only are they talented singers individually, but they have a blend that is second to none, coupled with superb song selection and innovative arrangements to boot. Producer Bob Caldwell is one of the best kept secrets in our genre, I would put his arranging and production talent on the same level as Wayne Haun or Jeff Collins. When you combine all of these elements, you have one of the finest quartets on the road today. If you’ve never heard Justified, this would be a great introduction. I guarantee you will love this project! Take A Stand releases on January 20th, and if you’re in the Michigan area you won’t want to miss the group’s CD Release Concert that night in Flint, MI at Central Church of The Nazarene. To find out more details about the concert or learn more about Justified, visit their website or Facebook page.